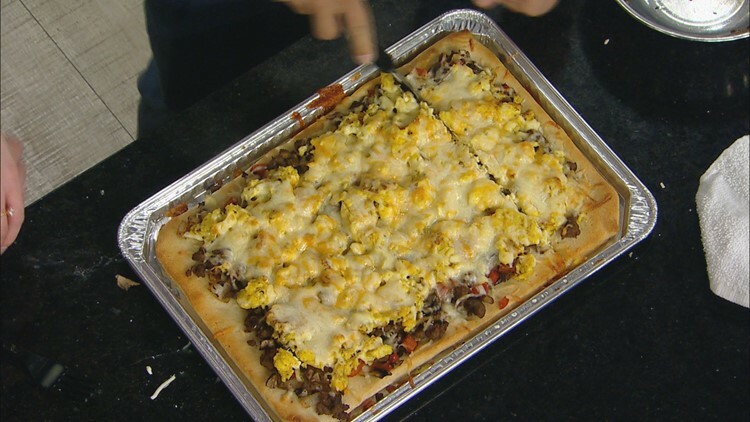 KARE 11's Alicia Lewis is sharing her recipe for breakfast pizza. GOLDEN VALLEY, Minn. — It's National Pizza Week! We're celebrating on KARE in the Kitchen with a breakfast pizza for our #Sunrisers, courtesy of Alicia Lewis. Follow baking instructions for the pizza crust. While in the oven, cook ground turkey meat. Once browned, saute garlic, onions, peppers and mushrooms until softened. Set aside. Scramble eggs. Set aside. Once pizza is half-baked, put on meat and veggie layer, then eggs and top with cheese. Bake at 400 degrees until cheese is melted and crust is browned.